This article examines the placing of equipment on the workbench and the way light reacts on the surface of your work. As you should by now be well aware, this series contains a few soapbox moments, but bear with me. Let us start with mallets. The majority of the mallets we purchase or have produced by a friendly turner are made from hardwood timber like Lignum vitae or similar. These types of timber are dense and if used to produce a mallet of reasonable size, with a reasonable contact area, would be too heavy for the average carver as the stroke of a carver's mallet is from the wrist rather than the arm. If you were to compensate for the weight by reducing its size then the contact area between the mallet and the end of the chisel handle would be reduced and become ineffectual. Increasing the diameter of your chisel handles could compensate for this, but they then become heavy and so other conditions will arise as described opposite. Most hardwoods when continually worked become shiny and polished. This again makes the connection with the chisel handle tricky because it does not bite into the mallet but slips across the face. 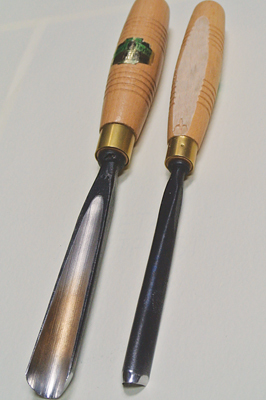 This, coupled with the fact that most manufacturers apply a glossy polyurethane finish to the heads and handles of their mallets and chisels, means you are trying to grip slippery handles while trying to bring together two highly polished surfaces; the only advantage is for visual presentation. Therefore, use abrasives to rough the ends of handles and the contact area of your mallet and you will be amazed at the difference. Traditionally mallets are highly sought after when made from apple (Malus sylvestris) as they provide the durability and the correct weight-to-size ratios we require, but beech (Fagus sylvatica) and elm (Ulmus procera) also produce a reasonable mallet. One of my tallest soap boxes arises at the use of metal mallets! For all the reasons mentioned above, why would you want to hit the wooden handle of a chisel with a piece of unforgiving metal? 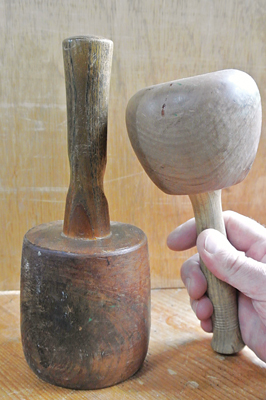 These mallets, also called dummies, derive from the stone carving profession and havenâ€™t any place in a woodworking environment. To continue the shiny theme, there shouldn't be any white surfaces within the workshop. This follows on from my previous article in Woodcarving 127, which deals with light entering the workshop. Light reflecting in the workspace should be restricted; this means painting walls and ceilings with a pale colour that slightly absorbs light, such as light blue, which only slightly reflects light and provides a light interior. Often, wood-panelled interiors are used which serve the same purpose, though can be gloomy. Carvings should also not have a glossy shiny surface applied to them. This only detracts from the detail within the work by blinding you with reflections. Shiny surfaces are more suited to turning and joinery work. Now for the second soap box moment: tools and mallets should stay in the place they are put so that time is not wasted chasing them around the workbench or bending down picking them up off the floor! Don't lay a mallet on its side so that it will roll off! 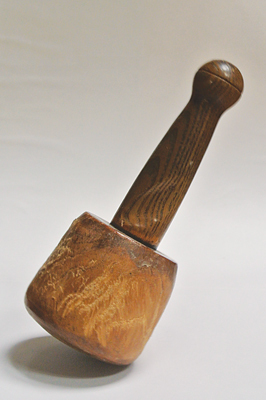 It is practical to have a mallet with a flat top so that when it is stood upright it doesn't roll around like a worn-out, rundown metronome; you will be chasing the handle or waiting for it to become stationary, which is irritating and a waste of time. Likewise, if a chisel has a narrower cutting edge than its handle's diameter, it could roll off the bench and cause damage to you or the chisel, so traditionally we make the handles hexagonal, octagonal or oval to inhibit rolling. Some modern day manufacturers incorporate hexagonal handles, but the round ones can be easily rectified by adding a flat area on to them. 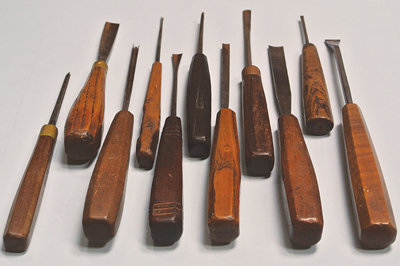 In the old days we would buy chisels without handles, making our own individual handles to incorporate these features. 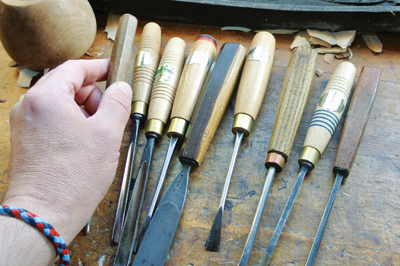 Placing chisels on the bench that have different handles also enhances recognition which again is efficient. In a professional workshop chisels should be placed in one direction facing towards you to ease picking up, but most importantly this is for safety! If you place chisels randomly you will cut yourself from an adjacent cutting edge. Using boxwood (Buxus sempervirens) for handles, though very tough and attractive, requires roughing on the ends to reduce the slipping effect. The master carver who taught me possessed a boxwood mallet that looked very prestigious, but for all the above reasons was impractical and therefore was flung across the workshop in frustration on many occasions. The moral here is to please ensure that the tools on your workbench aren't made from inappropriate materials and that they are of a shape that won't involve too much moving about. In other words, all shiny and wobbly parts should be eliminated from your workspace! I hope all of this is of value, it may seem insignificant but all craft traditions, whatever they may be, have an efficient, practical explanation for any task. My students can now relax after surmising from the introduction to this article that it was related to them. Though I do respectfully ask some of them to cover their heads when entering the studio to reduce the glare of light from their reflective surfaces!